Walter Turner was born in Ossett on the 21st October 1887 and baptised at the Primitive Methodist Church, Ossett on the 6th December 1887. Walter was the eldest child three children of Suffolk-born, coal miner, George Turner and his wife Eliza (nee Wilby), who married in 1887. In 1891, Walter has two sisters: Elsie (born 1890) and Edna aged 1 month, and the family were living on The Green, Ossett. In 1901 the family were living at Back Albert Street, off The Green, where George is working as a mason’s labourer and 13 year-old Walter was an errand boy. Walter’s sister Elsie is the only other child following the death of Edna shortly after her birth in 1891. In 1911 Walter, now working as a warehouseman, and his sister Elsie, are living with their grandparents at 1, Radley Street, Ossett. Their parents, George and Eliza Turner, were living on Bank Street, Ossett. On the 28th October 1911, Walter Turner married 21 year-old Gertrude Taylor at Earlsheaton Parish Church. It appears there were no children. After Walter's death in 1917, her address was given as Gertrude Turner, 68, Marlborough Street, Brantford, Ontario, Canada. In the years that followed, machine operator, Gertrude Turner made many trips to England from her home in Canada to visit her Taylor relatives who lived in Chancery Lane, Ossett. In May 1958, a 67 year-old retired, Gertrude Turner, born 31st July 1890, journeyed from Canada to Liverpool aboard the 'Empress of England' with a destination of 12, Appleby Place, Halton, Leeds. Her period of stay was five months and her intended country of future residence was Canada. 2nd Battalion, Coldstream Guards was formed in August 1914 at Windsor. and was part of 4th (Guards) Brigade, 2nd Division. On the 13th August 1914 the battalion landed at Le Havre and on the 20th August 1915, the battalion transferred to 1st Guards Brigade, Guards Division. His Service record has not survived and his MIC indicates only the British and Victory medals so that he didn’t serve overseas before the 31st December 1915. 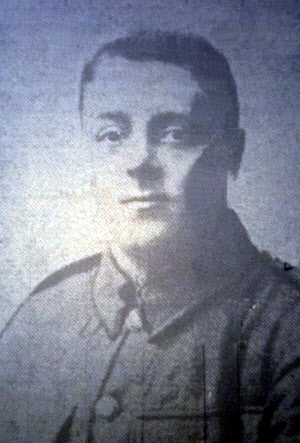 Private Walter Turner was killed at the Battle of Pilckem Ridge, part of the third Battle of Ypres at Passchendaele. 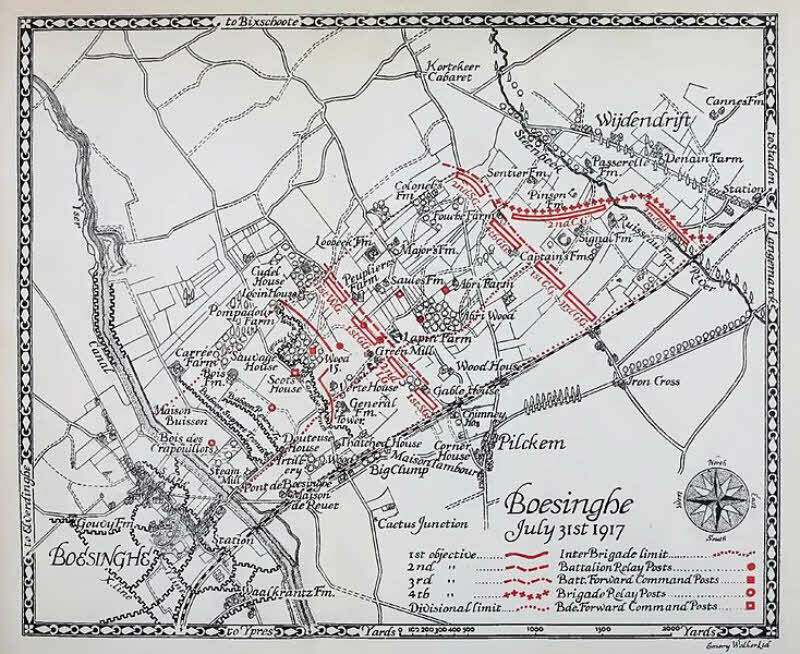 On 31st July 1917, behind the newly mastered creeping barrage, the allied troops climbed out of the their trenches along the whole front line, from Boesinghe in the North to Le Gheer in the South, and advanced towards the German forces. The enemy’s first line was quickly taken (the Germans had adapted the scheme of defence in depth, which consisted of a thinly defended front line of machine gun outposts and strongly more heavily defended support line) and the British pushed forward about one mile before meeting much stiffer resistance. Later in the afternoon the advance was stopped and pushed back in places by a carefully coordinated counter attack by specially trained troops. However, a worse enemy was afoot, the worst weather for 75 years, which turned the whole battlefield into a quagmire, the entire attack was stalled until the 10th August. "Ossett Guardsman Falls - On The Anniversary Of His Enlistment - The sad news has been received this week that Private Walter Turner (29), of the Coldstream Guards, a married man, whose home is at 26, Wesley-street, Ossett, was killed as he was going into action on the 31st ult. The information was contained in a letter sent to his wife at South Ossett by a well-known Horbury soldier and comrade of the deceased - George Sercombe. On the day of his death, Private Turner had been in the forces just twelve months, and he went to France in the beginning of February. He used to work for Messrs. Glover and Ellis, mungo manufacturers, Gedham." Private Sercombe has also written, acknowledging the receipt of a parcel of comforts addressed to the deceased by his widow, and stated that according to custom these have been shared among the deceased's comrades. He also forwarded deceased's pocket-book, and states that the platoon sergeant and all the deceased's pals joined in sending their deepest sympathy with the widow." Private Walter Turner died, aged 29 years, on the opening day of the third Battle of Ypres, during the action by the Guards Division to take Pilckem Ridge on the 31st July 1917. He is buried at grave reference IV. E. 14. in the Artillery Wood Cemetery,4 Ieper, West-Vlaanderen, Belgium. Boezinge is located north of the town of Ieper on the N369 road in the direction of Diksmuide. The Cemetery is located in the Poezelstraat, east of the village. At the time of the Armistice, the cemetery contained 141 graves (of which 42 belonged to the Royal Artillery), but it was then greatly enlarged when graves were brought in from the battlefields and small burial grounds around Boesinghe.